Ambassador Tom Turiano’s Wrote the Book on Teton Pass Backcountry Skiing. Hyperlite Mountain Gear Ambassador and professional skier Thomas Turiano has been writing skiing guide books for 21 years, but his most recent is the first ever “guidebook for backcountry skiing on world-famous Teton Pass,” he says. Teton Pass Backcountry Guide boasts 130+ pages of maps, pictures and guides explaining how skiers can get the most out of their time in the Teton Pass backcountry. When not writing guidebooks, Turiano guides climbing and skiing trips in the Teton backcountry, and he plays guitar professionally. He also claims more than 400 ascents in the Greater Yellowstone mountains and packrafts throughout the area as a way to reach the most remote spots. Turiano wants to help more people explore the backcountry, and he’s a big proponent of ultralight backpacking. Carrying less weight, he says, allows him to suffer less and thus be able to focus more on helping his clients achieve their goals. Turiano transitioned early on in his guiding career to lightweight philosophies. While attempting to put up new routes in the Teton’s during the 90’s, he was forced to rappel down after a failed attempt. During the rappel, his heavy pack almost flipped him over backwards due to the sheer weight of it. It was at that moment that he realized that it was time to reduce the amount of gear he carried and streamline his kit. In celebration of the release of his new book, we chatted with Turiano about what drives him to write and what it takes to write an comprehensive guidebook. Most of the inspiration to write “Teton Pass Backcountry Guide” was to get it done before someone else did it. Internet publishing has not shown itself to be a good business model. People seem to be willing to pay for information when it is packaged as something concrete, but unwilling to pay merely for information. In what ways does this build on the other books you have written? Teton Pass Backcountry Guide is my fourth book. It is the first book I have written in under six years, and the first book under 200 pages. The three other books are large volumes covering large areas. The Teton Pass book is very focused just on this popular and relatively small backcountry skiing area. It builds both on my first book, Teton Skiing, which covered the north half of the Pass, and my third book, Jackson Hole Backcountry Skier’s Guide: South, which covered the south half of the Pass. Feedback that I received on the Teton Pass sections of those earlier books informed the updates that went into my new book. So, there is a lot of new and updated information. How was the process? Was it difficult, easy, fun? The process of writing and publishing a book is never easy. It always takes 10 times longer and requires 10 times more work than you expect. Just when you think you have it done, new information arrives and you have to change things all over the place. The production team I had on this book made it as fun as book writing can be. Tess and Julie at OpenCreative in Jackson, Wyo., are fun and easy to work with. And I also had friend Greg Stone help me with the route overlays on the photos. In the past, I had to do all of the overlays by myself. This probably saved me six months. What does it take to write a book like this? How many hours do you spend in the backcountry? How much do you rely on other people for information? To get the depth of history and route information in my books, it essentially requires a lifetime devotion to the activity, as well as an eye for detail and a good memory. I try to record what I learned on each outing, but when it came down to it, I wrote the route information mostly from memory. Almost all of the route research and exploration pretty much is finished before I begin working on a book. In some cases, I’ll want to fine tune something, so I’ll take a break and go out to check it out. I rely on other people for information quite a bit, especially for the places I haven’t been very much or at all. I’ll contact people who I guess have been there, email them peak photos with lines marked with indicator letters, and ask them for details using the indicators as a reference. I ask them for route details as much as place naming history and anecdotal history. What’s the focus of this book? 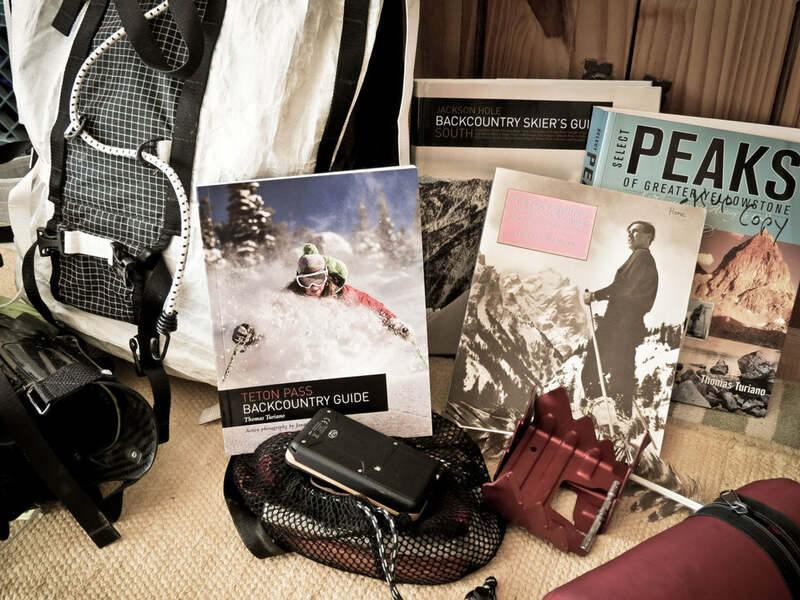 Teton Pass Backcountry Guide begins with an intro section that contains info about ski seasons, avalanches, parking, snowmobile use, selecting objectives, wildlife and Teton Pass backcountry skiing history. Then, there are four chapters, each covering one of the four quadrants of Teton Pass terrain. Quadrants are delineated by the east-west running Highway 22, and the north-south running hydrologic divide. Descriptions are organized by peak with various runs listed off each peak. Descriptions of approach routes and canyons are intermingled near pertinent peaks. What do you want people to get out of it? 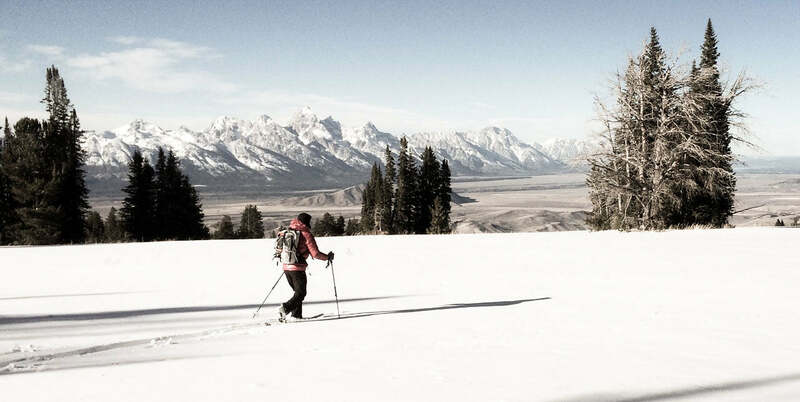 I hope the book will help new skiers find their way in the somewhat complex terrain of Teton Pass, as well as spread out regulars that are in a rut of always skiing the same places. I also hope people will gain a sense for the long history of skiing on the Pass and an appreciation for the area’s human-powered low-impact traditions. Is there anything I’m not asking you that you want to share with me about this book? I am especially proud in this book of effectively bringing home the great early ski pioneer, Fred Brown, who left Jackson Hole in 1947, and whose legacy was never recorded or even acknowledged locally. Teton Pass Backcountry Guide gives a brief account of his activity on Teton Pass, why he left Jackson Hole and what happened to him. There will be much more written about this great man in the coming years, both by myself and others. One final question, what is it about skiing that you love so much? I love skiing when it is simple and free. I don’t really enjoy it when it is encumbered by unnecessary equipment, rules and regulations. My favorite time is in the spring when hazard is low, there’s no deep snow to slow you down, temperatures are relatively warm so not much clothing is required and the sun and colors of the world are bright and rich. Unlike summer trails, roads or climbing routes, a snowfield is a vast canvas that allows complete freedom. Lightweight skis, boots, poles, a few key articles of clothing and a few things in your Hyperlite Mountain Gear pack are the only tools you need to cruise wherever you want to go and wherever you think is most efficient. For more information about Thomas Turiano or to purchase one of his guidebooks, check out Jacksonholebackcountry.com. The post Tom Turiano’s New Teton Pass Backcountry Skiing Guide Book appeared first on Hyperlite Mountain Gear Blog.